I could spend days and days blogging about Hello Kitty craziness. She pops up in some pretty amazing places these days. Like Hello Kitty sausages. Mmmm. Delicious. But this afternoon I received an email from an associate (thanks JA) which directed me to this article. I'm conflicted. I find it amusing, of course, but I'm also just a little offended. 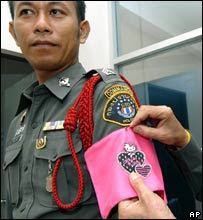 Why is it so shameful to wear a cute pink armband? Probably the male officers get mocked because of the stereotypical male's shunning of the color pink and adorable things like Hello Kitty. 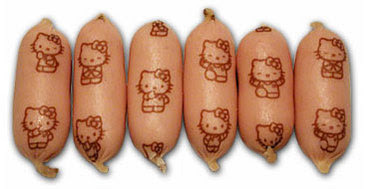 But what sadistic mind came up with the concept of Hello Kitty sausages? Are they implying something about the meat that goes into them? I'm guessing it takes away their masculinity, as Anonymous just said. I'm confused about something. How come, on the bottom of the post, it says you posted at 2:09, when over here in it's 1:36? Is it because of the time differences? oh wow my friend is so obsessed with hello kitty everything that you can imagion she has with hello kitty on it!As for the pink armband, i think it might inspire some rebels to do something wrong for the sole purpose of wearing the armband!! Hello Kitty sausages are strange enough. 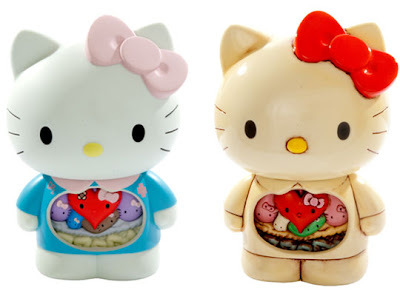 But did you know there's also Hello Kitty Bento? And they're done very meticulously by the looks of it. Anonymous@ 8:38 ; Can it will you? I like her un needed posts. Hello Kitty is very feminine; she is also very childish. She isn't the kind of thing you want to be wearing when you're a law enforcement officer, especially a male one. Before I get flamed, yes, she's cute. I wonder how bad you have to be to be forced to don one of those. Is it a bad punishment? Or more mild? oh no. I'm wearing a pink armband. I am now forever shamed. Yeh, right. Why do all of Hello Kitty's organs have faces? The Japanese are so weird. And I say that in the most affectionate way possible; I love Japanese stuff. Speaking of which my Latin teacher said that if one of us gets a perfect score on the biggest test of our lives (402 vocab words, all correct!) he will dress up as a chicken. well their completely pointless espically since she nver writes bout her BOOKS. which is just about hmm i dont know..the whole POINT. dont get me wrong i love the books, and have been very patient but now its just ridulious. shannon hale doesnt take a year and her books are INCREDIBLE. same with lemony sniket and ann brashares. also Lisi Harrison. Then you should have plenty of books to keep you entertained. Why are you wasting so much time commenting on a blog? Pink is a manly color! FFFFFFFFF most artists take decades to create their masterpieces D: Anaka DID blog about her next book. She's just amusing us now with these awesome weird news while we wait for her next book. i am reading other books. may i remind you that i did write that i do enjoy her books, and that post is from a very long time ago. by the way, you all are coming on here as well and i have rights too, so if i wish to speak out, i can. that's why i am. no disrespect kristen i just didnt think it would take so long, espically if you were quoted saying something, but you never corrected that mistake. one question- the first pic on this entry... WHAT IS IT? They have Hello Kitty contact lenses!!!! It's crazy! Also go to google and look up ' high tech contact lenses' awesome and awful at once! Besides, her posts are AWESOME!!!!! It's exactly what you'd think it is. Hmmm...maybe I should suggest that my brother consider becoming a police office in...where? Bangaladesh, was it?...that would be interesting. Mushroom Cloud: the interesting thing about Marx is that the governments that CALL themselves communist don't actually follow what they guy wrote in his book. 2. I assure you it is a breach of ettiquette to come on here and insult Kristen and praise other authours, especially as it's Kristen's site! 3. If you have the right to insult Kristen, then we have the right to defend you. And reason to insult you back. hmm, sounds interesting..... It would be funny to meet an officer like that. What if it is a female officer?? Wow the hello kitty sausages look odd. Pink Hello Kitty armbands...LOL! That's a punishment that would embarrass even me! Cruel and unusual, but I pity the judge in that case.